For my day-to-day lipstick needs, I usually wear whatever berry-colored lipstick came in my last gift-with-purchase. It doesn't really matter what I use, because about an hour after I apply it, most of the color will be on my coffee cup and I'll switch to Chapstick for the rest of the day. (I'm aware that it makes no sense to keep using a product that wears off so easily, but it looks pretty for the brief time it's on. And it's not like I paid for it.) When the situation calls for a lipstick that will actually stay on my face, I turn to the more labor-intensive CoverGirl Outlast All-Day Lipcolor. It's takes a bit more effort to apply, but man does this stuff stay put. Outlast All-Day Lipcolor isn't all that difficult to work with, but since I usually like to smear my makeup on as quickly as possible, my lips are only treated to a three-step process for weddings and bar mitzvahs. First I apply a junky drug store lipliner. This probably isn't necessary for most people, but I've always been bad at drawing in the lines. Next, I paint on the lip color with the fuzzy-tipped wand. It's wet when it first goes on, so you have a few seconds to smack your lips together and wipe away any mistakes. However, you can't take too long because after drying for about a minute, it's really on there. The problem with a lot of long-wear products is that they get too dried out, but CoverGirl solved this issue with a second tube of clear balm that goes over the lip color. Some other brands' long-lasting lipsticks come with a gooey gloss, but the topcoat is smooth like my beloved Chapstick and smells great. (Conveniently, it's also sold separately, in case it runs out before the basecoat.) Since the lip color won't budge, you can quickly swipe on the clear balm all day long. Without even looking in a mirror, you'll have lipstick that looks like you just carefully reapplied it. CoverGirl claims that Outlast All-Day Lipcolor lasts up to 16 hours, and it's true. These special occasions often end with me collapsing into bed without a proper face scrubbing. In the morning the lipstick is still on me, but my pillow's fine. Yet, removal is pretty easy. I just put a coat of Vaseline on my lips (or in a pinch, some other balm that contains petroleum jelly) and it wipes off onto a tissue. The stuff just works — so well, in fact, that I should probably rethink my policy on using whatever free lipstick turns up in my makeup bag. 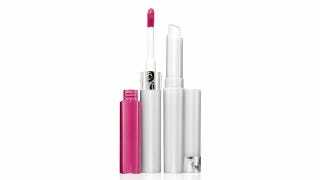 CoverGirl Outlast All-Day Lipcolor, $8.99 for a 0.13 oz topcoat and 0.13 oz basecoat at Ulta.